Aim Sports MTMR03 AR15 M-Lok Handguard 15 Picatinny 6061-T6 Aluminum Black Anodized in. The sleek modern designs of Aim Sports AR15 freefloat MLok handguard offers such features as a U.S.made steel barrel nut and builtin machined antirotation tabs. Cut for weight reduction and meticulously engineered to be ultra light this system retains the utmost in robust construction with a 1913Picatinny top rail mounting system and seven rows of MLok mounting surface for ultimate modularity attachment points for all your MLok accessories. 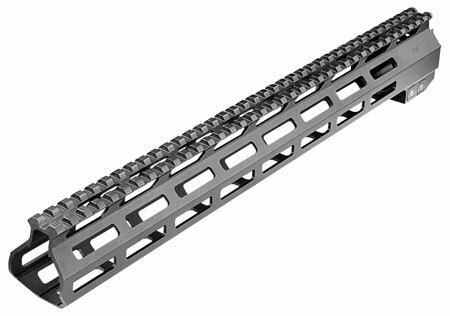 The AR15 freefloat MLok handguard works with low profile gas blocks. This model is 15 and weighs 0.82 ounces."